Reinhard Mohn, who helped transform media group Bertelsmann AG from a German book publisher to an international media company, has died, the company said Sunday. He was 88. Mohn, together with his wife, helped steer the company into a wide array of publishing _ including the acquisition of U.S.-based Random House _ music and other ventures. He spent some 45 years with the company and most recently served as honorary chairman of the company's supervisory board. 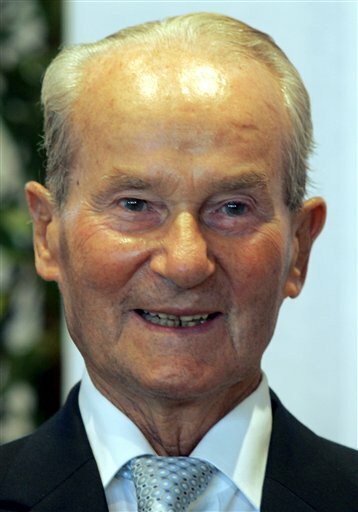 "Bertelsmann mourns the loss of one of the greatest entrepreneurs of our age. Our thoughts are with Reinhard Mohn's family, especially with his widow Liz and his children," Bertelsmann Chief Executive Hartmut Ostrowski said in a statement. Born in Guetersloh in 1921, Mohn took over his family's printing and publishing business, C. Bertelsmann Verlag, in 1947. He expanded the operation by embracing sales representatives and catalogs and the company grew to incorporate magazine publishing, television broadcasting and other avenues. In 1971, he helped oversee the family-owned company's transformation into a stock corporation and become chairman and chief executive. In 1977, he established the Bertelsmann Stiftung foundation. He retired from the company in 1981 but remained on Bertelsmann's supervisory board _ the German equivalent to a U.S. board of directors _ for a further decade. Bertelsmann's assets include book publisher Random House, TV broadcaster RTL, a majority stake in magazine publisher Gruner + Jahr, and the Direct Group book and media clubs. Bertelsmann at one point held a 50 percent stake in the music company Sony BMG. It sold the U.S. portion of the Direct Group book club in 2008. Though headquartered in Germany, Bertelsmann's 106,000 employees are scattered across its divisions in more than 50 countries. The company is a privately held stock corporation that is owned by the Mohn family with 23.1 percent and the Bertelsmann Foundation with 76.9 percent. The company has operations in 50 countries. Mohn is survived by his wife and six children. Funeral plans were not disclosed.